After a whole saga of leaked pieces of information and spy photos, the LG Versa (also known as the VX9600) has finally been officially announced in a press-release by LG and Verizon. The device has become popular, thanks to its unique modular design, the main purpose of which is to deliver a top-notch versatility, allowing for attaching various accessories to the body. So far, the only attachment that has been officially referred to is the hardware QWERTY keyboard. Apart from it, we’ve also heard of a gaming pad, portable speakers and a Wi-Fi modem, but there is no official information about these yet. Specs-wise, the Versa will be a regular phone (non-smart), featuring a large 3-inch TFT touch-sensitive display with a resolution of 240x480 pixels, 2-megapixel camera and an animated 3D graphic interface. In addition, the device will offer a joyful internet experience, thanks to the HTML browser, which will even feature Adobe Flash support, in order to enable playing online videos. The handset will be available at Big Red’s online store and in Verizon Wireless Communications Stores, starting March 1, at a price of $199.99 after a $50 main-in rebate and a 2-year customer agreement. So since there is adobe flash support will things like myspace music , or videos on peoples my space will play on the phone? Our LG rep came in the other day and I got a chance to play around with this phone. It is actually really cool. As far as the new menu interface it is really cool. There is a new two step system where you can access any function of the phone with two menu selections. The 3d interface is pretty cool too. I think the tabbed browser is the main selling point for this phone however. It is pretty similar to the Dare, but the interface is really improved. The keyboard is very easy to attach and barely adds any bulk to the phone when closed. I think this is truly a versatile phone and expect good things from it. Was the phone top heavy cause the keyboard was thin??? The keyboard is thin like you say. When I used it for a second, the thought never crossed my mind that it was top heavy, you may find it to be so however. 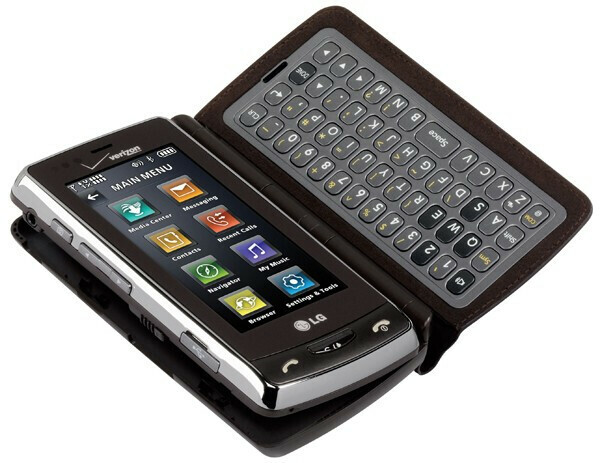 There is no direction pad on the keyboard like the env2, so navigation still takes some getting used to, I think you still navigate by using the touch screen. that could be a little awkward. I've played with it, it is top heavy and quite annoying. It kept feeling like it was going to tip over on me. The fact that it has Flash support is a deal maker for me. It's about damn time. More phones will get flash support too, but browsers such as skyfire have provided flash for quite a while.